Yesterday I attended the 21st Annual DIA Conference on Marketing Pharmaceuticals in a Time of Change conference in New York City and heard FDA updates on direct-to-consumer (DTC) advertising. The meeting was well attended by pharmaceutical company representatives, who have a clear need to hear what's up at the FDA from the horses' mouths -- not that the FDA officials were equestrian in any way, although Marci Kiester, PharmD, DDMAC Group leader, did sport an attractive PHS service uniform like the one shown here. At the end of her presentation, Dr. Kiester summarized recent FDA untitled and warning letters (let's ignore the difference for now) regarding DTC ads shown on TV and the Internet. Among the products that won the honor of receiving such a letter were Viagra (see "Violative Viva Viagra Video - Still There! "), Aderall XR (see "Vyvanse Warning Letter: Too Late! Shire Got Rid of Ty Pennington Long Ago! "), and Yaz (see "YAZ Commercial Yanked from TV, But Not from YouTube"). She showed videos of the ads and then discussed why they violated FDA laws and regulations. These were all old news to me. Kiester, however, did talk about a NEW warning letter that the FDA sent to GSK just last week. 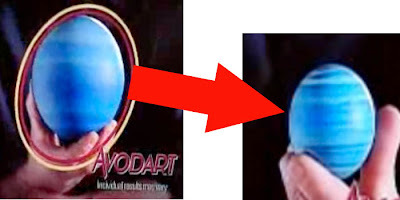 The offending ad was the Avodart "Planetarium" TV commercial, which you may have seen (see YouTube video below). This is so new that the FDA has not yet published the letter on its web site! BTW, this is ANOTHER FDA swift action that occurred months after the ad has run its course. Too bad the conference organizers or panel moderator did not allow questions until the end of the conference! Sorry, but I can't afford to go back to NYC and ask Kiester the embarrassing question "Why did it take FDA so long to send the letter?" I already know the answer any way. Kiester showed a flow diagram detailing how warning letters get created at FDA. There's about 4 hierarchical layers it must get kicked up through before it reaches the FDA's chief counsel office where it probably languishes under politico-legal review for a month or two (see "FDA DTC Review: The House that Troy Built"). Back to Avodart. The commercial had a number of regulatory faux pas. First, the ad claims that Avodart is the only drug that shrinks enlarged prostates, which cause BPH. Not true, said Kiester, who cited Proscar as another drug that shrinks the prostate gland. Second, the commercial claimed that Avodart works better than other drugs. Not supported by clinical trials, said Kiester. But the last and to me the most interesting violation cited by the FDA was that the ad's imagery overstates the efficacy of Avodart in shrinking the prostate. 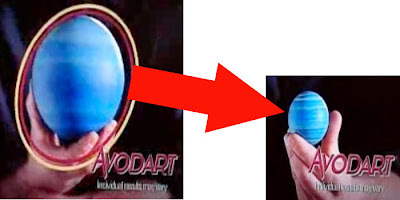 The following image shows two frames from the video representing how the ad depicts a shrinking prostate by way of analogy to a shrinking model of a planet. Looks like an ostrich egg shrunk to the size of a chicken egg! Kiester said that Avodart clinical trials show a 20-25% reduction in prostate VOLUME, which corresponds to about a 10% reduction in diameter, whereas the ad imagery shows a much greater reduction in diameter. To check her math, I actually measured the diameters of the planets in the ad before and after Avodart and found that there was a 57% reduction in diameter between the two images (a decrease in diameter from 4.7 cm to 2.0 cm as measured in a printout of video frames). That reduction in diameter corresponds to an amazing 92% reduction in VOLUME, which is MUCH more than the 20-25% supported by clinical evidence. Looks like a large chicken egg shrunk to the size of a regular chicken egg! Is it worth an extra 20 cents per dozen? UPDATE: On 2-29-2009, a day after this post, FDA uploaded the Avodart letter (see here for pdf version) and the storyboard that was submitted to the FDA on March 3, 2008 (see here). To find this letter on the FDA web site you have to do a search because it's not yet listed in the "Warning Letters" page under "Regulatory Actions." I guess they are not listing this letter there because the letter is not strictly a "warning letter" addressed to the company's CEO. This letter is addressed only to the regulatory affairs person at GSK. BTW, as in previous cases, this letter was sent almost 1 year AFTER the FDA had the storyboard in its possession. Hopefully in the near future doctors will be able to shrink the prostate cancer into nonexistence.